Are your kids having trouble with their fraction lessons? Do you feel they could be solving their fraction problems a lot quicker than they are right now? Do you think your child could benefit greatly from practicing fraction problems, but find this easier said than done? Well, never fear, for free fraction games are here! Fraction Games to the Rescue! Getting your kids to practice fraction problems can be tough, especially if they do not like the subject to begin with. However, fun fraction games can make this very task a lot more appealing and enjoyable. 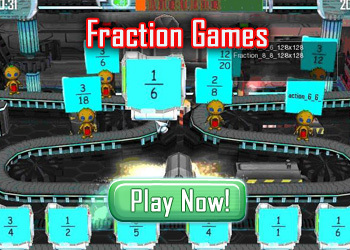 Get your kids playing online fraction games, and you might even have them asking to play more! Playing interactive fraction games is good for your kids in more ways than one. Apart from getting kids to willingly practice fraction problems, fun fraction games can help your kids master their fractions in other ways as well. Most fraction games have interactive visual representations of the fractions that are being worked on. This helps children think about fractions in more concrete terms. Interactive equivalent fractions games are useful in helping kids understand the concept of equivalent fractions – a basic yet crucial lesson in fractions. Further, simply by being fun, fraction games help replace the negative associations with fractions in kids’ minds with more positive ones – this has a great influence on how easily kids can understand and master the topic. That must be why pizza fractions games are so popular online!